I often struggle with my not wanting to speak of it and jinx it side versus my I'm not superstitious side. Though I suppose I am superstitious if I'm afraid to speak of something in fear that it will affect the outcome. Let's go with I am superstitious but choose to ignore them rather than let them control my life. So then, what's been going on? First up is I am almost done paying for last year's Flood. Technically I've paid it off already but we had a trip to Vegas and the holidays and some other minor expenses that have kept my credit card balance up beyond a comfortable level that I could pay off each month. I estimate that I will have paid off by June if all goes well. 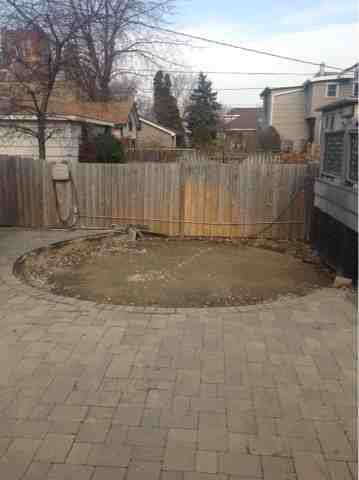 Second, we are finally going to do something about the hole in our backyard! When we bought the house we asked the owner to remove the swimming pool. I think he offered or our agent suggested he fill it with sod but we didn't take that option -- which would likely have been withdrawn once we started the negotiations. In hindsight we should have done that. I didn't do it because one I didn't realize that there would be a hole, I assumed the pool was on top of pavers. Secondly, we figured we would do something with it and only end up ripping out the sod so why put it in the first place, especially in winter when it would die anyway. So lesson learned. Add a paver edge near the fence and against the back of the house and a small landing near the gate to next to the deck. I'm also having them lay a PVC pipe under the pavers near the garage and laying it under the grass area and ending under the deck. This is future-proofing in case we later decide to install garden lights, sprinklers or heck even run a ethernet cable from the house to the garage in case my pipe dream of building a LAN closet in the laundry room ever sees the light of day. So when that is done and if the weather ever decides to permanently stay above 70, we can have some sort of house warming event or at least invite smaller groups of friends over. Most of my friends do not cross pollinate well so we either have to do a big bang invite everyone party or smaller gatherings of same clique type friends.